More from the missing month of June. This originally appeared on 23 June 2004. But challenge is the frosting on my cake, and I loved the thought of the indigo yarn slowly fading along the crisp cable and King Charles Brocade pattern edges like jeans seams do. I plunged ahead, knitting up the required swatch. The length of my test swatch shrank about 5% the first wash, but continued to shrink in each of two successive washes/volcano drys. Total shrinkage after three washes was on the order of 8-9%, so I figured that the 10% shrinkage listed on the label was close enough. Width shrinkage was on the order of 1-2%. Minimal. I’m a little handicapped in writing this up because my copy of Inverness is tucked away in the storage cubby along with all of my yarn and pattern stash. 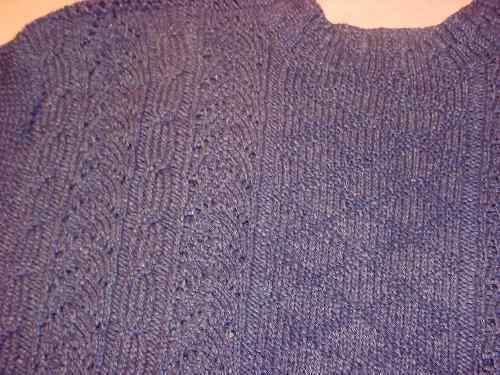 I recall the pattern was written for worsted weight, with a recommended gauge (in stockinette) of 5 stitches per inch. My yarn was listed as a DK, but it was a rather robust DK, closer to worsted than to sport weight. Also, because I planned for shrinkage, I figured that knitting it a bit loosely wouldn’t matter. My gauge swatch results bore this out. So I went ahead. I recall that there was quite a bit of ease in the largest size (a men’s 42). I did add a little over an inch of width to the body. That wasn’t hard because the sleeves are dropped sleeves and aren’t set in. I made the seed stitch panels on the side under the arm each 3 stitches wider. No fuss. Now, the sweater was long to begin with, but I’m tall. I decided I wanted to keep it long, so I added 10% to the length measurements. That means that I knit around 30 inches of body. I also added to the sleeves (more on this below). Having done my adjustments, I cast on and knit away merrily. I especially liked the small details that don’t show up in the photo. The ribbing bears a nifty little cable. There’s a row of eyelet welting above it, and just below the seed stitch mock saddle shoulders, and at the top of the sleeves. The sleeves are joined to the body by working a row of picked-up stitches along the shoulder line, then doing three needle bind-off to join those stitches to the live sleeve top stitches. All in all, tons of fun. Apologies for the color in this detail shot. It’s tough to take a snap of something that’s dark blue without using studio type floodlights, even with a flash. The actual color is closer to the full view, above. 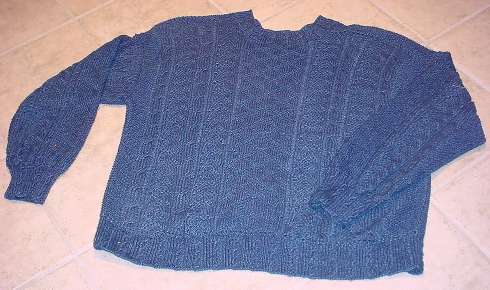 After my knitting was finished I washed my giant sweater as I had my swatch: hot water, cold rinse, followed by volcano heat in the dryer in the company of my navy blue sheets (so I wouldn’t have to worry about the sweater’s blue migrating to other things). Three trips through and I had achieved around the same percentage shrinkage as my test swatch. I adore my finished sweater. It’s soft and supple, and the comfortable kind of baggy that only the most beloved an worn-out sweatshirts ever achieve. I can wear it indoors without something underneath in spring and summer, and layered over another shirt in the winter. (Were it wool, it would be too warm for all but winter wear indoors.) Even though it’s cotton and weighty compared to wool, the thing isn’t heavy and saggy. The color is fading as I anticipated. The exposed edges of the twist stitch cables and purls in the brocade are becoming lighter than the surrounding background. I’m looking forward to seeing this effect intensify over time. Plus I love being able to fling the thing into the washer and dryer instead of pampering it like I do most of my other sweaters. My first Inverness G. was for my husband and looked exactly as the one in the Straker photo. My second was for me, and I used a heavier yarn. I’m still wearing it – and getting compliments on it – over 10 years later!